At Regen Projects in Los Angeles, a powerful art show is taking place. Along stark white walls are data rendered into painted charts, poetry embossed in golden letters, and fire hose flattened into a tapestry. Markers of the post-Emancipation and the Civil Rights movement, they make up Chicago artist Theaster Gates’s “But to Be a Poor Race,” an art show that delves into the history of poverty and racism in the United States. Through his show Gates explores the not only the hardships but “the underlying richness of a culture borne out of a lack of resources in the aftermath of slavery” as well. “Reliquary,” a fox pelt-adorned stone frame, attests to his dual purpose, recalling the post-Emancipation class signifiers noted in the surrounding paintings, which incidentally had been gathered into data by W.E.B. DuBois. The abstraction of the charts and graphs of data and the concreteness of objects like the fur pelts and the fire hose is a striking juxtaposition, reflecting the artist’s interest in archiving history. When Kanye uses seven samples in a song, or John Legend chooses to use a Bill Withers remake, theyre being archivists. They may not call themselves that, and people might not hear Bill Withers when they hear John Legend, but there comes the possibility of understanding Bill Withers, and that history starts to unfold. Im interested in how one simply needs to implement history. Perform it. Amplify it. Freak it. … This show is … some sincere quiet time to contemplate the symbolic things that are on my mind. Maybe the thesis will conclude that to be a poor race is to be a better race, or more interesting one. 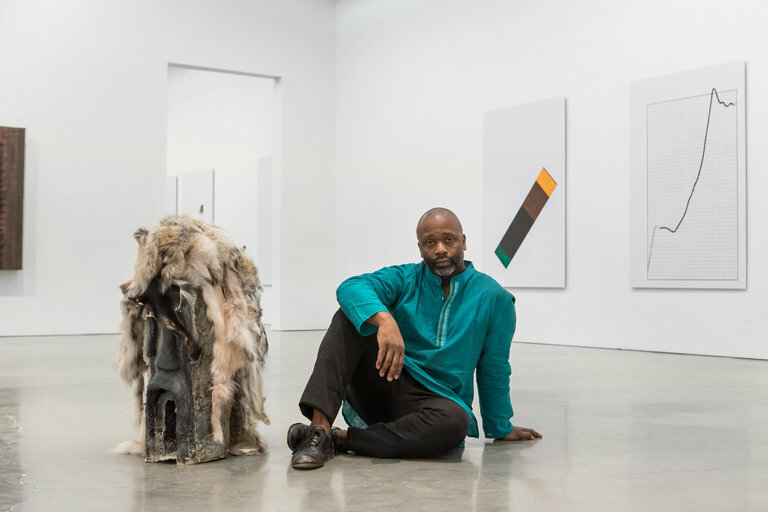 Theaster Gates’s claim–and his show–is one that indeed invites contemplation. Those of us in Core may recognize the title of the show as a quotation from W.E.B. DuBois’ The Soul of Black Folk, a work now 114 years old. Gates, then, has drawn upon a history of struggle to highlight the depth of the culture that emerged as a result. The importance of archiving history and culture through material objects and numerical data is further emphasized in his renovations of buildings in Chicago as community centers and archives. There, as in the gallery, the artist points to the importance of remembering the past and comparing with the present. Read T Magazine’s article on the subject here. “Theaster Gates: But to Be a Poor Race” is on view at Regen Projects in Los Angeles from January 14 to February 25.